The Preble County Board of Commissioners declared Sept. 17-23 “Constitution Week” in Preble County during a meeting on Monday, Sept. 17. Commissioners presented a copy of the resolution to the Commodore Preble Chapter, Daughters of the American Revolution. Constitution Week is the commemoration of America’s most important document. It is celebrated annually. This celebration of the Constitution was started by the Daughters of the American Revolution. In 1955, DAR petitioned Congress to set aside Sept. 17-23 annually to be dedicated for the observance of Constitution Week. The resolution was later adopted by the U.S. Congress and signed into public law on Aug. 2, 1956, by President Dwight D. Eisenhower. According to DAR, the purposes of Constitution Week are to emphasize citizens’ responsibilities for protecting and defending the Constitution, to inform people the Constitution is the basis for America’s heritage and the foundation for its way of life, and to encourage the study of the historical events which led to the framing of the Constitution in September 1787.
https://www.registerherald.com/wp-content/uploads/sites/41/2018/09/web1_DAR.jpgThe Preble County Board of Commissioners declared Sept. 17-23 “Constitution Week” in Preble County during a meeting on Monday, Sept. 17. 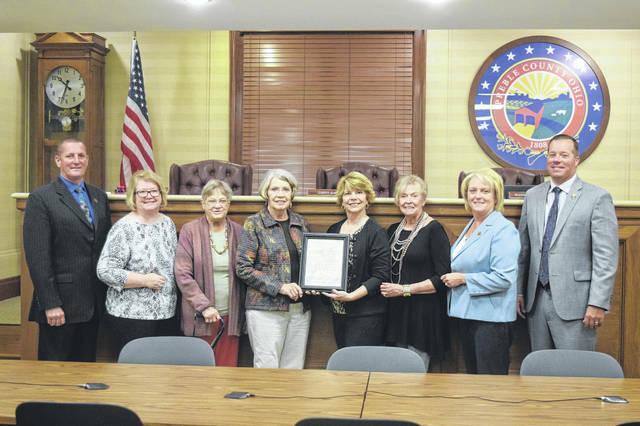 Commissioners presented a copy of the resolution to the Commodore Preble Chapter, Daughters of the American Revolution. Constitution Week is the commemoration of America’s most important document. It is celebrated annually. This celebration of the Constitution was started by the Daughters of the American Revolution. In 1955, DAR petitioned Congress to set aside Sept. 17-23 annually to be dedicated for the observance of Constitution Week. The resolution was later adopted by the U.S. Congress and signed into public law on Aug. 2, 1956, by President Dwight D. Eisenhower. According to DAR, the purposes of Constitution Week are to emphasize citizens’ responsibilities for protecting and defending the Constitution, to inform people the Constitution is the basis for America’s heritage and the foundation for its way of life, and to encourage the study of the historical events which led to the framing of the Constitution in September 1787.